Oyanagawa Valley (大柳川渓谷) is located in Fujigawa town, Yamanashi Prefecture. It is a part of Minami Alps. 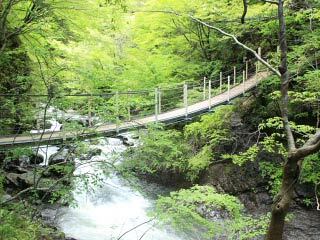 This is one of great one-day-hiking spot in Yamanashi with many beautiful waterfalls. During the early summer, it has beautiful green leaves. In Autumn, it has great Koyo leaves. 1. use JR Minobu Line to Kajikazawacuhi. 2. use local bus to Jukkokukannkouchusyajo. There are 5 waterfalls and 10 suspension bridges. Oyana river is coming from Genji mountain and runs into Fuji river. Hiking on this valley takes about 3 hours.